My posts lately have been from some of my favorite remixers that simply have been in a slump or a just busy perfecting their craft. Mike Morales A.K.A. 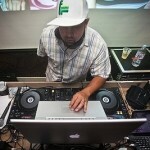 DJ Kue representing NoCal Bay Area, SF came correct on this one. Ive heard my childhood favorite 8 bit games remixed, Super Mario, Tetris, Zelda, but Kue dug a little deeper and kept most of the original flavor from it in tact. I cant see a huge crowd of people in a club losing their minds unless I was DJing a special event for E3 or Comic-Con where all the fanboys and girls can geek out and let the freak flag fly. Im all for it, get you some!! !